Haha a holiday to give thanks! Thank you Datsun for giving us all your sweet looking cars! But how does the Z car have such a closer affinity to Thanksgiving? Well, after the big turkey meal, what you hear? ZZZzzzz ZZZzzzz haha it’s in everyone’s dreams! While you’ve got time to kill between holiday shopping or people sleeping, here’s a special on the Z from the History channel. Happy Thanksgiving! Anyways, the one thing that really stood out on this ’77 is its engine bay. Wow. But let’s first check out the outside – because it’s gotta look good inside and out! What got me was the engine bay. Unlike the 240z and 260z before it, the 280z was born with certain genetic pre-conditions – increase in safety standards, heavier parts, more complicated systems and notoriously: stricter emission standards. 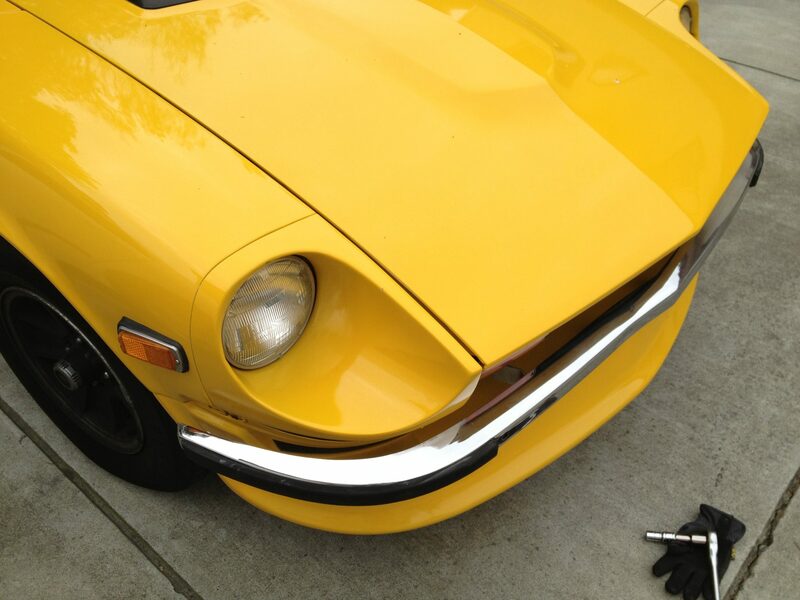 Yes, the 280z was born with the ERG valve vestigial digit. The bad teeth of fuel injection. Scraggly hair of cables and wires. The MAF funny laugh. These aren’t necessarily bad things. They’re just something that must be managed. And THIS car has done such a great job managing all that unsightliness and with a color scheme to boot. Things that help with a well managed, very nice looking engine bay? 1) Cleanliness – Engines are dirty and need cleaning every now and again. While cars older than the 280z, especially carbureted, have less parts making it easier to clean (less parts, more empty space to get around those parts), newer cars have nice wide shrouds to cover all the small parts (big cover pieces just take a nice wipe down). The 280z was blessed with the worst of both worlds – it’s packed with lots of exposed parts. But a negative can always be turned into a positive: keeping those parts clean can help highlight the maze like intricacies. 2) Organization – Once you’ve gotten the little traps free from grime, it’s time to get them in order. Chaos can make sense when properly organized. Think a book shelf: lots of different colors, shapes and sizes but when organized things can be found, followed, and admired. Those spark plug wires? On trees and straightened. Wires around the fuel rail? Bundled and cinched together. The more parallel lines created, the more uniform and organized it will look. Even the traffic of wires above can look orderly! “I have a colorful personality! 3) Look / Color Scheme – With all the parts in any space, keeping a unified look can help bring it all together. Like the mugs of rascals in a boy scout troop – all different faces, but orderly when wearing all the same uniform. And with the right color, you can make a scene pop! The one above carries the blue from the original air intake across various engine parts: clamps, elbows, covers, caps, labels. Though deep purple and light teal are an uncommon combination, it still works to me because any purple car already screams “I have a colorful personality! Look at me!”. In the age of Photoshop, you can definitely pre-plan, saving time and money. A super fun tool I also use when designing is Adobe’s Color CC (previously called Kuler). Monochromatic, complimentary, triad – there’s so many great combinations to choose from, you’ll end up using it to repaint your house! Whether the cabin interior, under carriage or engine bay, if it’s clean, well organized and uniform, it will help complete the car as a whole and show just that little extra pride and care to tie it all together. In my neighborhood popped a T-Topped 280zx! Blazing blue and looks like a daily driver. I’ll definitely want to catch up with the owner when we get a chance! But prefer this over the S30 body? WHAT DO YOU THINK? Which body style of Z do you prefer?